Specifically for optometrists, ophthalmologists, opticians and other eye-care professionals, eyeCD10 is a tool for quickly converting and implementing ICD10 codes for the ophthalmic office. Quick Corporate Minutes (aka "QuickMinutes") will allow you to enter your state-required minutes and resolution requirements. It is easy to overlook the important legal requirements to maintain the corporate status, especially when the corporation is a "one-man" operation. But in the eyes of the law, a corporation is an independent entity and as such, must maintain appropriate and complete records. But in the eyes of the law, a corporation is an independent entity and as such, must maintain appropriate and complete records. Quick Corporate Minutes was developed to help you achieve these goals with less effort. Affordable ophthalmic Electronic Medical Records software for optometrists, ophthalmologists and eye care professionals. 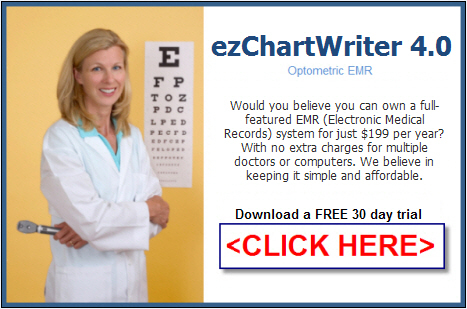 ezChartWriter is a powerful ophthalmic EMR system, yet is easy-to-use for even computer novices. Designed by an optometrist for optometrists and other eye care professionals. A very affordable way to take your practice paperless. It includes a built-in word processor, SOAP based encounter creator, report editor, Rx logbook feature, reminders and clinical notes documentation tool in one application. The front-end allows you to organize your patient demographics, Rx's and insurance information. Additional modules for insurance claim billing, appointment scheduling and creating recall lists are available. You can even import/export your patient demographics with ease. ezChartWriter uses familiar chart structure as the cornerstone of the user interface. For example, to create a patient chart, one click gets you there. A patient chart looks onscreen similar to what you would see in the paper format. Encounters, Rx's and notes are presented in lists that can be double-clicked to call up the appropriate report. The report editor is similar to standard word processors seen in Windows. Shots Tracker is a way of managing a vaccination/immunization history for yourself, your family or your patients (depending on the version you purchase). Because there is no centralized method to track a person's immunization history, many times you end up getting duplicate shots. Your childhood vaccination history, school and military records and adult immunizations can all be listed in one place. Using our software to assist with organizing this task, you can easily generate a complete and up-to-date list of immunizations (which you can have your current medical doctor sign off on). The FTC Red Flags Rule requires many businesses and organizations to implement a written Identity Theft Prevention Program to detect the warning signs – or “red flags” – of identity theft in their day-to-day operations. By focusing on red flags now, you’ll be better able to spot an imposter using someone else’s identity to get products or services from you. As a practical matter, the Rule applies to you if you provide products or services and bill customers later. Our software allows most businesses to become compliant with the FTC requirements with a minimum of hassle. The Red Flag Rule Wizard guides you step-by-step through the process of creating and implementing your Identity Theft Prevention Program. Still writing Rx's by hand, but don't want to spend thousands of dollars on high-priced Electronic Medical Records software to generate computerized Rx's? Use ezScriptWriter to store, print, and edit all your prescriptions (including scheduled medications that require a hard-copy of Rx). eyeCEonline.com is the premier site for finding online continuing education courses for optometrists, opticians, eye-care providers and staff. Get all your online optometric continuing education (OD CE) in one place. This site provides links to all the existing online optometrist CE sites. Most are COPE approved CE courses. You can easily find a complete listing of online optometric and ancillary staff CE courses, with brief descriptions, costs and regulatory approvals... even at the last minute. Another aspect of online CE is the lower cost per unit hour. Most courses are very low cost and, in some cases, entirely free. Online CE will never take the place of the lectures, conferences and vacation CE with colleagues and experts in the eye care field. But it can be a valuable method to supplement your learning.